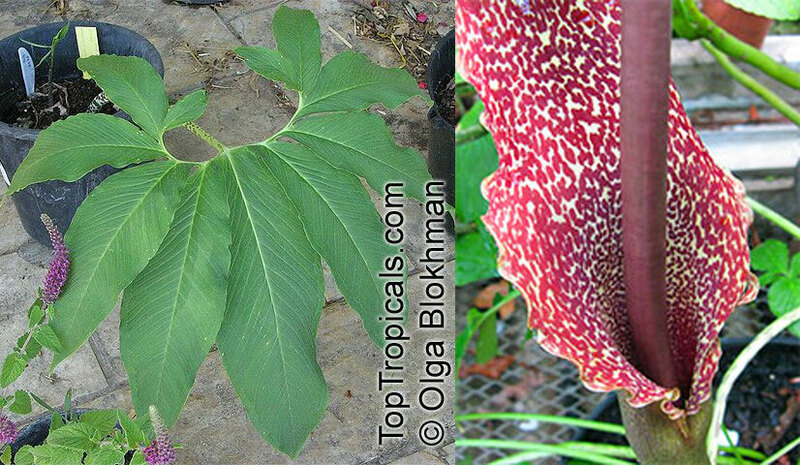 Rare Amorphophallus ralative, Typhonium venosum (Sauromatum venosum), is a common shade-loving house or garden plant from temperate and tropical Africa and Asia. This plant is also known as the Voodoo Bulb because of its ability to flower from a corm without soil and water. Tuberous perennial with solitary, segmented round leaf and strange, arum-like flower. Rare collectable, it is a showy exotic container plant. Typhonium grows to around 20 inches tall from an underground corm. A large corm can spawn multiple new corms. Inflorescences emerge before the leaves. An inflorescence has a purplish-brown-spotted, yellowish spathe and a purplish-brown spadix which emit a strong odor perceived as similar to cow manure, rotting flesh, or a dirty wet dog, depending on who smells the inflorescence ;) The odor lasts only a day and attracts carrion-feeding insects which can pollinate this plant. Plants we have in stock, have tubers 1-2" in diameter. The plant goes dormant in winter and starts sprouting in March-April. Keep soil slightly moist but not wet, and wait for the magic leaf to pop up... The plant should flower within a year or two.